Make sharp incisions across the lamb fat and insert the sliced garlic and rosemary into the incisions. 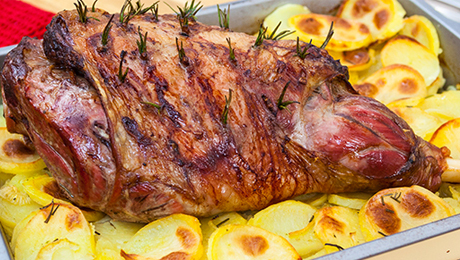 Cook in an oven for 1.5-2 hours if you like your lamb rare, or for up to 3 hours if you like it well done. I'm new to all this cooking and I am very good at nearly everything I cook. I'm going to cook lamb for Easter Sunday for my good mate Christy and myself, so hears hoping. I'm having some red wine followed by brandies. I never cook lamb but I'm trying it this year, I have read a few recipes yours seems to be the best so I'm using it. Look forward to seeing some more.